Hubby and I headed to LongHorn Steakhouse last night to enjoy a dinner, thanks to a holiday gift certificate from our favorite “eldest” son and our lovely daughter-in-law. From the moment we walked through the door, we were impressed with the renovations. As always, we were greeted with a warm welcome from the hostess who seated us in a big comfortable booth. Monica, one of our favorite servers, promptly came over with another friendly greeting. We chatted briefly about the changes and how beautiful and classy the restaurant looked. Monica commented how everything was new, right down to the silverware. The dinner was fantastic from the salad to the main course to the scrumptious dessert that hubby and I shared. My steak, the famous Flo’s Filet, was so tender and tasty, I oohed and aahed over every bite. I rarely eat steak, so this was a BIG treat for me. The service from our food server was outstanding as always. I am not a big fan of chain restaurants and probably the biggest compliment I can pay LongHorn Steak House is that they feel like a family owned establishment. I find it interesting but not surprising that 13 of the original staff members are still there. (They opened right before Father’s Day 2005.) I give a lot of credit to management (Erica Holgate and David Wheeler) for creating a work friendly environment. I also observe each time I visit the restaurant how “hands on” management is, chipping in wherever necessary and visiting tables to greet customers and address any concerns. LongHorn Steakhouse is located at 3 Restaurant Court in Asheville, North Carolina. 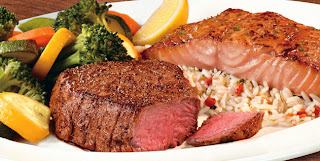 For more information, visit them at www.longhornsteakhouse.com.